Blog > FAQ > Will My Cockapoo Get Along With Cats? Wouldn’t it be fantastic to have some a lovely cat in your home as well as a Cockapoo? If you are a big fan of cute pets then the idea of getting both of them is likely to be pretty exciting. Of course, most people worry that their pets might not all get on together well. You certainly don’t want to end up with a cat and a Cockapoo fighting and snarling at each other all day long. So, what factors do you have to know about in order to make a smart decision and lets find out if Cockapoos are good with cats? The first piece of good news is that Cockapoos are renowned for being very friendly and sociable dogs. They tend to get on very well with other Cockapoos, others breeds of dog and also cats without any problems. Your dog probably isn’t going to be a problem in this relationship. He might occasionally chase the cat around the house or garden but this is most likely to be a game they play rather than anything serious. Unless you see that there is a real problem or that the cat is getting nervous then you will eventually feel comfortable leaving them alone together when you go out. Don’t forget that a well-trained Cockapoo will be a lot easier to deal with when you are trying to get him to make friends with a cat. 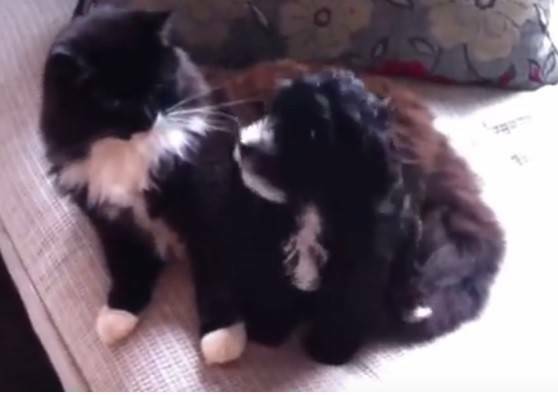 If there is a problem in this relationship between Cockapoo and cat it is likely to be caused by the feline side of it. Cats can get nervous around new friends and he might start to swat your dog with his paw or hiss at him. Ideally, you will have a big enough space for the two of them to go their separate ways if they need a time-out now and then. In fact, if you have some high spots or small spaces that only a cat can access then this will help him to feel that he has a safe refuge he can head to for peace and quiet. As with any relationship between humans, the success of this new friendship will come down to their different personalities. Do they share the same interests or are they like chalk and cheese? In many cases, the Cockapoo will be more energetic and fun-loving. Cats tend to be solitary animals and they often don’t like having a dog pestering them to play all the time. Your cat might get frustrated if he just wants to spend time on his own doing cat stuff but a friendly dog is constantly around trying to get him to play and run about a lot. It might be a good solution to keep the dog in a different space from the cat as much as you can. In an ideal world, you will see how beautiful it is to watch a cat and a dog grow up together as a family. Really, the best way to help them get on well together is to give them the chance to live together from an early age. In this way, it is possible for them to feel like a real family and to genuinely care for each other. Even a shy or slightly wild cat or dog will usually feel comfortable living alongside a pet that has been their companion since they were very young. If you are bringing an older pet in to your house then it makes sense to find one who is used to living with other animals if you can. If you have already made the move and decided to bring a Cockapoo and a Cat together under one roof then it makes sense to take things slowly. You can get started by letting them spend small amounts of time getting to know each other and then separating them for a while. Even if things are going well from the very beginning you should still be careful to keep them apart for spells. Using a leash or a crate for your Cockapoo is a smart move even if you are completely sure that he isn’t going to react badly to seeing a cat come into his home. This will allow the cat to approach him with confidence and slowly check him out. Try to make both of them feel good to be encouraging and rewarding good behaviour. However, don’t rush things or try to force them into any awkward situations too early. The truth is that each case like this will be different. In some cases it may only take the Cockapoo and the cat a few days to feel comfortable together but in other cases it could take weeks or even months. You just need to be patient and carry on rewarding good behaviour while scolding them if they behave badly towards each other. Once you can see that they are now comfortable together you will feel happy taking away the leash and the crate, to allow for a more natural interaction. If there are any signs of jealousy creeping in or if the dog starts to play too rough then you can bring back the leash or the crate and go back to the beginning again. Another important point is to feed them in separate places. In this way, they won’t feel the need to compete against each other for food. It will take you a while to feel sure that you can leave them together when you go out but if you carry on doing the right things then this day will eventually come along. It is a wonderful sight when a cute Cockapoo and cats get along together at home. It certainly isn’t impossible to manage this but it will take some hard work and patience on your behalf. Of course, once you get your new family feeling comfortable together then you will have the satisfaction of seeing that your pets are happy spending time together and having a lot of fun.